Quinlan O’Malley, 9, and his brother, Mason, 5, (top) of Newton slid down the giant snowbanks lining Quincy Market on Tuesday. Lessons before and after school. Moratoriums on teacher workshops. Digital libraries created on the fly. Class projects. Blizzard bags. And canceled school holidays. The gobs of snow that fell in the last 15 days have put the state’s school districts in the precarious situation of trying to make up for lost time. Each day of learning lost to sledding must be made up. So while the first snow day brings glee, the fifth — or in some cases the seventh or eighth — not so much. Students must be in class for 180 days each school year, and the state Department of Education isn’t budging. If weather is the reason classes are canceled between the first day of school and March 31, all lost days “must be made up by rescheduling full school days,” according to a Friday memo from Mitchell Chester, the state education commissioner. 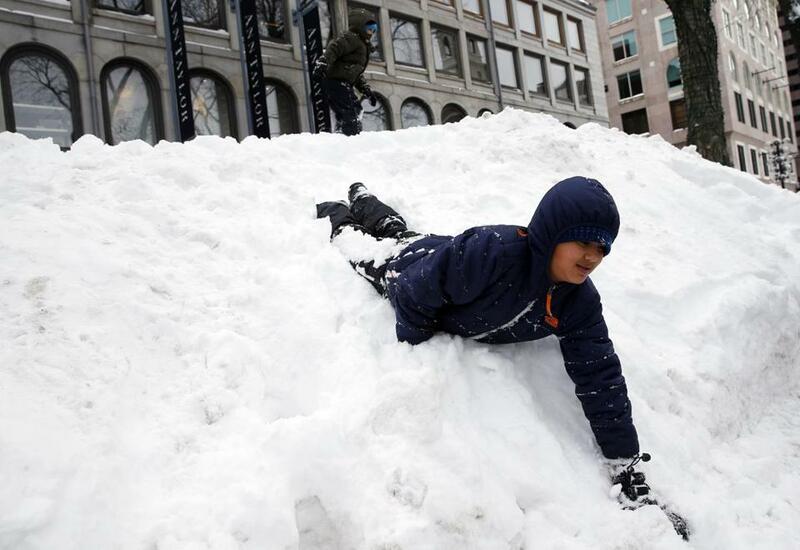 Boston students have missed eight days of school, seven because of snow, meaning the school year has been stretched until the end of June, and the Evacuation Day and Bunker Hill Day holidays have been canceled. But that is just how the district is making up for the lost calendar days. Schools are still trying to figure out how to maximize the amount of instructional time students get, especially in the days before the state’s high-stakes tests. “We are going to try to squeeze in as much time as we can using both before and after school,” said Joy Salesman Oliver, principal of the Higginson Lewis K-8 School in Roxbury. Teachers are also using online tools so students can keep burnishing their math and reading skills, and students receive homework packages every Monday to be returned Friday, so they have work to do during the week, she said. Still, the principal said, it is difficult to come up with a solid plan because the weather has been so unpredictable. One resource available to all students in Boston is an online library the district created last week when it became obvious the snow days were not done. “A few of us got together and said, ‘Let’s figure out how we can at least provide teachers and students with some resources,’” said Mark Racine, the chief information officer for Boston public schools. The digital library, modeled after the brick-and-mortar kind and divided into sections based on age, went live Sunday. By Tuesday, it had been visited 1,500 times, mostly by elementary students, Racine said. The snow days — and growing snow drifts — are disruptive in other ways too, upending classroom routines, which educators say are especially crucial in elementary schools and urban school districts. Burlington students have been out of school for a total of five days, which is how many days the school system planned to absorb. “We technically don’t have to do anything right now if we don’t cancel another day of school,” Conti said. The school year will now end June 25 barring further disruptions. Still, Conti said he is preparing a contingency plan not just in the event of more snow days — and his fingers are crossed for that not to be the case — but to make sure the school year does not drag on unnecessarily. The preliminary proposal would have to be approved by teachers, the Burlington School Board, and the state. And in urban school districts, where school is a place of stability for many students whose home lives are less so, this time away from the classroom is especially disruptive, educators say. “For a lot of our kids, we’re the most stable thing going in their lives. Every time that gets disrupted, it makes it harder for them,” said Andre Ravenelle, superintendent of Fitchburg’s public schools, which has had seven snow days thus far, two more than what was built into their school calendar. Ravenelle said he is considering canceling the Good Friday holiday, and part of April vacation could become a casualty. He’s also considering putting a moratorium on professional development days that the district is not financially committed to. Maybe, he said, the time has come to rethink the 180-day school calendar. Maybe the total hours, and not days of instruction, should carry more weight; maybe the state needs only one weeklong vacation after the winter holiday instead of two, he said. “I hope this year is a year of reflection,” Ravenelle said. Akilah Johnson can be reached at ajohnson@globe.com. Follow her on Twitter @akjohnson1922.